The coils of razor-wire lain by a rag-tag group of workforce workers atop the thirteen-and-a-half meter high fences seek to define Hungary’s southern border by mapping a visible barrier against refugees fleeing Syria’s civil war. It is low tech. As much as blocking attempted passage across the border, the project has been a crusade of Hungary’s Prime Minister, Viktor Orbán, in an attempt to inject vigor into the Hungarian strongman’s flagging political career, as much as to create fear among border-crossers. 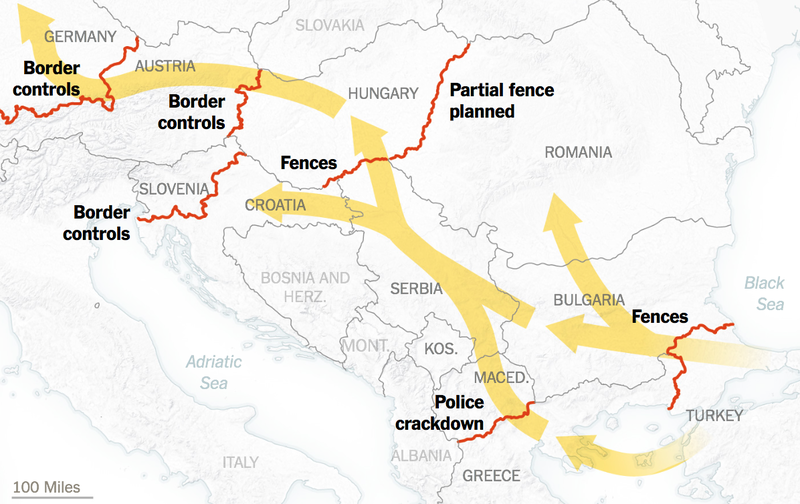 Since Orbán’s public promise in mid-June to construct a fence that defined Hungary as Europe’s frontier to mid-September, made mostly by state-paid workers, created a sufficiently imposing fence to close the country’s border with Serbia. 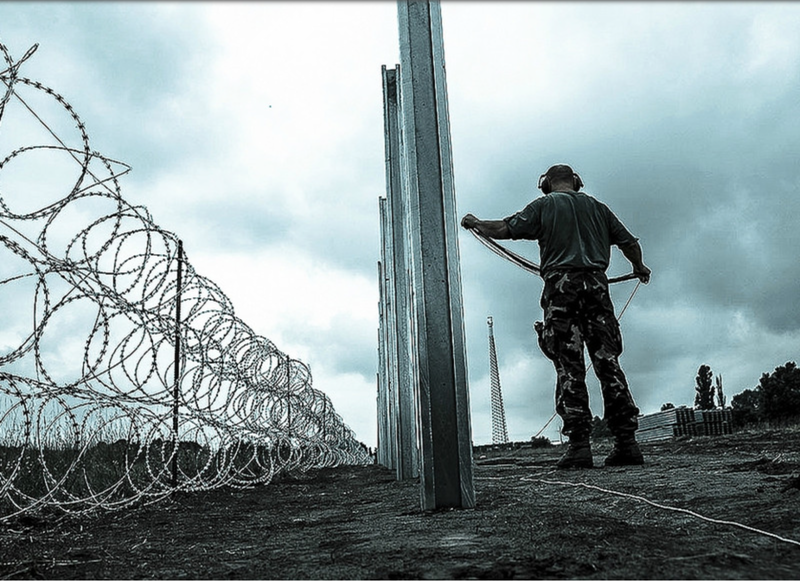 This is border building as performance–introducing the sort of fencing that reveals his own strength to his nation, and to the European Union, staged by thousands of uniformed soldiers and with military vehicles and designed to illustrate the integrity of Hungarian border policy before the world media, as much as to demarcate Hungarian territory. The spectacle of the border has made a lasting impression on Europeans and the global media, creating a visual representation of a border for entry into Europe, even if it has not helped process refugees. The fence has come to symbolize the tragic plight and obstruction faced by refugees who took a humanitarian corridor across the Balkans on foot or by car to enter Schengen countries, and present them face-to-face with an unexpected obstruction that would define Hungary’s integrity. The fence topped with razor wire and manned by improvised forces of military policing has become a notorious national symbol reveals the blatant disregard for human rights in a time of increased humanitarian crisis. 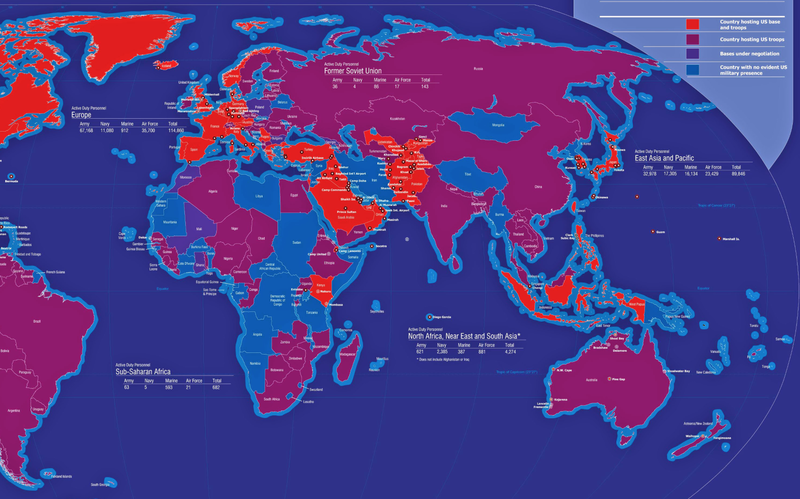 It rests on a deeply misguided mapping of the bounds of the Europe Union, an entity under increasing pressure, now understood more as an employment zone than a geographic entity. The state police who ask refugees to apply for asylum at the newly prominent border as they wait in “transit zone” create a spectacle for Hungarians as much as for the global news. 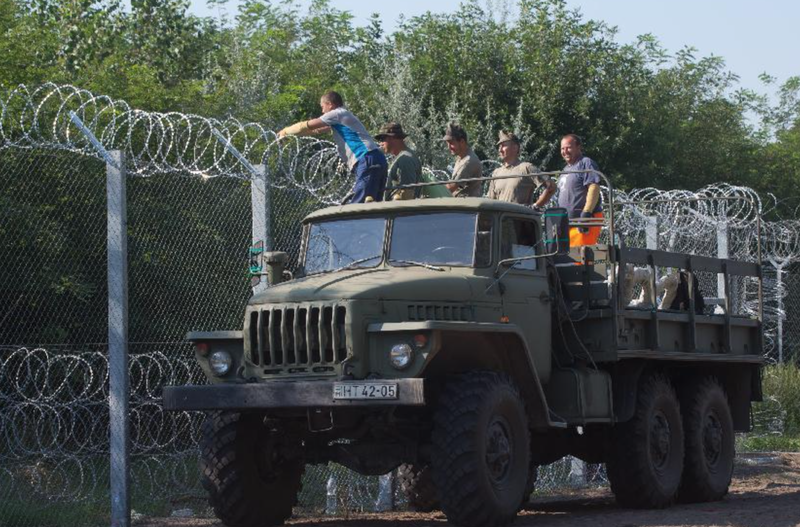 The liberal use of concertina wire along one hundred and ten miles (one hundred and seventy-five km), topped by security cameras and surrounded by border guards, created a newly militarized space–whose relation to an earlier iron curtain, by no means lost on bloggers, clearly evoked an earlier sense of a work-camp. The eagerness with which Orbán promoted and adopted the project of border boundary building may originate in the somewhat liminal geographic situation of Hungary in Europe, but the viciousness of the enterprise reflects Orbán’s increasing desperation–and that of his nationalist anti-immigrant FIDESZ party–makes due on his promise to Hungarian voters to act as defenders against the imagined enemy of “migrants” entering the country, to inflate its power by bolstering its own borders in increasingly militaristic terms. For while the construction of the wall is indeed part of an increasing construction of fences, border barriers and border controls that have emerged across central Europe to repel an increasingly desperate attempt of refugees to enter Europe, and find employment and safety in the Schengen region, the decision to construct such a brutal wall complete with “transit zones” to process refugees may be understood as having its origins in the grotesque theater of Hungarian politics: although the decision to erect the wall along Serbia’s frontier may precipitate a crisis in refugee flows, it has origins in the willingness of the current Hungarian government to act as the defender of an imagined “European” identity–as evidenced in its blame of the European Union itself for not clearly formulating a plan or policy to deal with refugees, and to assign soldiers along European borders to process human rights migrants. And as winter descends along a well trodden “West Balkan route” of travel, migrants face new dangers that demand a humanitarian response. For the dramatic expansion of an even larger two-hundred-and-sixteen-mile long fence topped with razor wire along Hungary’s border with Croatian frontier in mid-October promises to interrupt refugees’ movement on an established West Balkan route, but create a backup that would constitute and even more shameless affront to global human rights and an affront to their actual plight. Orbán has portrayed the entrance of migrants as an offense against Hungary’s frontiers in manipulative ways–but also wanted to strengthen border boundary to illustrateHungary’s ability to guard the border of “Europe,” after an unprecedented number of 20,000 refugees illegally crossed the border to enter the European Union by crossing the Hungarian border in the Balkans during 2013, a number which had doubled during 2014, increasing alarm of poor border management and giving rise to an unprecedented wave of xenophobic violence. In ways which will have quite steep consequences for the actual fates of many refugees in Europe, constructing so prominent a wall is a bizarre exercise both in Hungarian historical memory, and a posturing of a a local strongman who seeks to represent a global crisis through the distorted lens of purely local terms to Hungarians, in what he paints on a global stage as a crisis in European identity. Orbán has quite outrageously called for “defending the common borders of the European Union with European forces,” but blocking the transit of refugees–or quarantining the newly arrived in euphemistically dubbed “transit zones”–will not intimidate them or prevent their arrival in Europe, but only reroute them, and delay or divert any successful humanitarian strategy from being effectively framed. This makes the pretense of acting as a defender of Europe all the more outrageous. 1. Although the wall was ostensibly built to protect Hungarians from the arrival of refugees, the symbolically powerful wall across the Hungarian border has become an attempt to preserve the strength of Hungary’s government against a largely imaginary enemy. While few refugees hope to settle in the country permanently, the border-fence is a particularly tragic rewriting for the start of the twenty-first century of Marx’s bold statement at the start of The Eighteenth Brumaire that figures and personages of history not only often repeat, as Hegel believed, but do so first as tragedy and then as farce–if the farce is poised to precipitate an international human rights tragedy of its own. For the walls evokes historical memories for Hungarians and for Europeans as an assertion of the right of state, even as it seems staged a spectacle to illustrate the strength of the Hungarian state to ward off an entirely imagined enemy, and aggressively grandstand on an international stage in myopic ways. 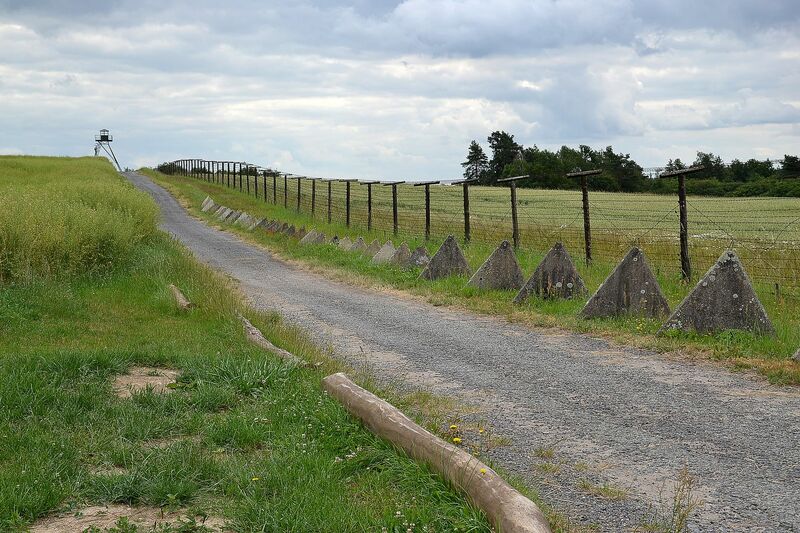 For if the actual iron curtain was dauntingly divisive, the rather hastily erected fence nominally sought to prevent the arrival of refugees, far less impermeable for desperate refugees than an illustration of the Hungarian government’s resistance to allow progress across a Balkan passage, than notice of the government’s open disregard for their rights. Refugees are penned like animals along the fences congruent with national borders, rather being than extended asylum or offered any needed humanitarian assistance or refuge. The building of the border barrier by conscripted labor–as much a police–the border boundary is more of a declaration, and a site for exhuming memories–both of the electric wire fences taken down along the Hungarian-Czech border in 1989-90, pictured below, retained when the fall of an “iron curtain” was celebrated–with far more violence than that longstanding boundary barrier. Indeed, the sole surviving fragment of that border is far less threatening than the new barbed wire barrier that was ostensibly built to block entry of the destitute into Hungarian lands. The fence on the Hungarian-Serbian border was allegedly constructed only after Orbán declared himself open to consider all options which could stop the flow of refugees into Hungary short of physical closure of the border, after discussions with Serbia. Hungary’s Minister of Foreign Affairs Péter Szijjártó mustered the declaration that he believed that its planned construction would not violate international accords or laws–yet it is truly hard to even imagine how he thought it did not, and was quickly recognized in Budapest to be a somewhat ghastly public unthinkable refashioning of the Hungarian state. Beyond obstructing or refusing entrance of those who have travelled from former homes through crowded refugee camps in Turkey and Greece, recast refugees fleeing destruction in Syria and Iran as criminals. For as well as a means of preventing passage across borders, the notorious construction of the border fence is particularly opportunistic move of Prime Minister Orbán: constructing such imposing border fences cynically re-regulates the very legal procedures to which asylum-seekers are forced to submit. Is the recent rehabilitation of this oldest and most authoritarian of fictions of national identity not the most reactionary of performances of national exclusion? 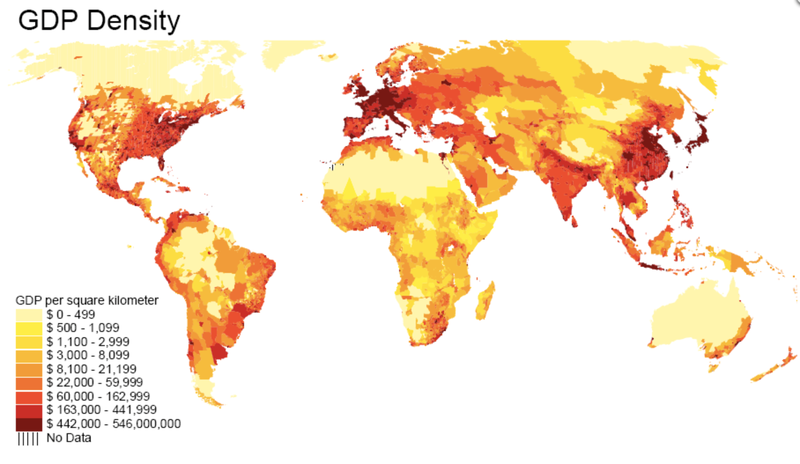 The geographical location and situation of the imposing border fence have been mapped multiple times in the news as an obstacle to the northward progress of “thousands of migrants and refugees”, and portrayed as a crisis in European unity as Germany and other countries ordered temporary border restrictions. But the fences that run across Hungary’s borders are less often examined as a dangerous psychological projection of the Orbán government’s loose understanding of legality and manipulation of national identity. For the increasingly militarized boundary fence not only traces the border barrier around Hungary. It translates the mapped boundary line into an impassible frontier, surrounded by resettlement camps, which effectively places refugees outside both the status quo and apart from the state. Has the marginalization of refugees along Hungary’s borders also become an occasion for recovering memories of the marginalization of populations in Hungarian politics, most recently the Roma people and other immigrants? The patrolled barrier on Hungary’s southern border ostensibly responds to fears of an “endless flow” of illegal immigration which Prime Minister Orbán warns would threaten to “overrun” Europe. By militarizing the border barrier on its southern border, the Hungarian government ostensibly seeks to defend its protection of its citizens, but also allows itself to charge refugees with violating local laws and protocols in ways that disrespect international law. Since the fence was completed on September 15, Prime Minister Orbán’s priority recasts him a strongman able to protect the country and defend the state. The barrier offers Hungary’s government the excuse to punish attempted crossings with three years of imprisonment and automatic deportation. This haunting but perverse image of the reception of migrants–at a time when Hungarians view emigration as a more dangerous threat to the nation than immigration or the arrival of new and potentially skilled workers–offers an illustration of the strength of the nation and the extent to which the nation will go in taking strong mesures against an imaged enemy. For in refusing entry to refugees as they seek to enter the European Union, confining them in “transit zones” sealed off from Hungarian territory, but open to Serbia, Orbán’s government turns the other face to many without medical, legal, or financial assistance. The barrier quarantines those pleading from asylum on the margins of the country through which they desire passage. Does the fence, patrolled by police and the state army, not provide an image of the defense of the nation where one lacked before, blocking transit across a route where some 170,000 refugees have already entered the EU this year? The militaristic maneuver seems a show of force disproportionate to, as does the recent dispatching of armored vehicles and hundreds of troops to its Croatian border. In undermining the most central values of granting asylum that most all European Union countries affirm, dehumanizing refugees as the new target of xenophobic accusations recasts their plight as a disturbance to the state. 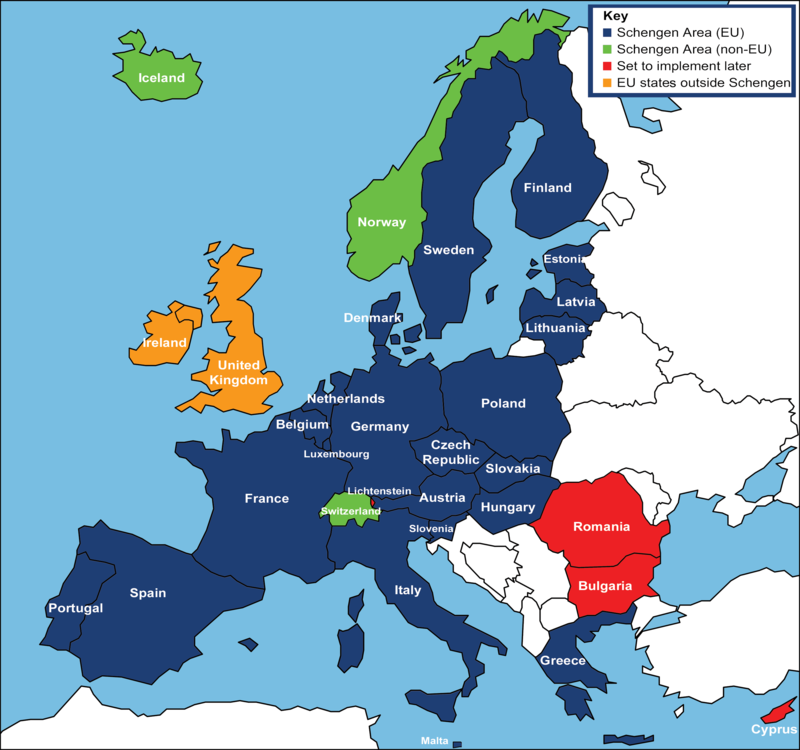 And in using national workers to create this boundary barrier, as an artificial boundary of the state, the Orban government could be accused of reallocating funds that the EU had in fact provided his country. What role does the fence serve in blocking refugees entrance to the Schengen countries where they have travelled in search of work? Designating those who attempt to cross its borders as “illegal” dramatically reinforces regional ethnic prejudices, blaming those undocumented for their circumstances and alternately recasting their identities as muslims, opportunists and actual terrorists, the construction of border barriers crudely exploits the mapping of the national unity as a way to divide space and the flag as a threatening sign of national belonging. 3. Hungary may lack prison space to accommodate refugees, but seeks to portray itself as able to manage the “crisis” of refugees’ arrival, choosing deportment while ignoring their presence or dilemma. It is almost paradoxical that the insistence on protocols of boundary-crossing and legal procedure should be so strongly espoused by Prime Minister Orbán–who has regularly flouted and rewritten laws and the constitution, and attacks an independent judiciary. For the Hungarian border barriers continue Orbán’s openly anti-democratic defense of the Hungarian “homeland” even as he flouted the many EU reprimands his government has already received. Building the border wall offers a way to ignore global actualities even as refugees cannot continue to comprehend the interruption of their attempt to flee civil war. Refugees from Turkey and Syria who have crossed the Balkans have been met by similar barriers along the borders of Bulgaria, Slovenia, Austria, Germany, and Macedonia, to be sure. While Hungary insists, in double-speak fashion, it hasn’t betrayed the Schengen Accords allowing free transit, whereas border controls were thought dissolved by the European Union, they have returned with a vengeance, stranding many families and individuals in the non-places of airports, parking lots, and improvised camps guarded by attack dogs. 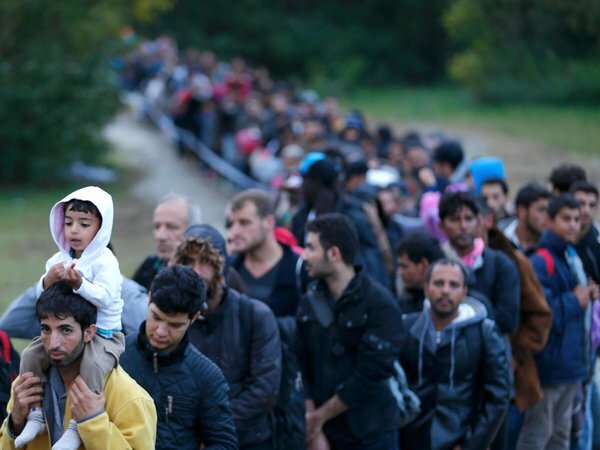 Current plans to expand similar fences and border barriers have spread to Serbia, Ukraine and Estonia, who see themselves as victims of Germany’s vice-chancellor promise to accept one million refugees and half a million yearly. The fence has served to direct media attention at the problem of a refugees trying to enter western Europe, illustrating the reflexive response of a government providing similar fences of barbed wire on its borders with Romania and Croatia–lest Europe indeed be “over-run,” whatever being over-run by those on foot might mean. Perhaps we have a failure to map their arrival less in terms of lines of sovereignty–and border fences–and governmentally than charting their painful itineraries. 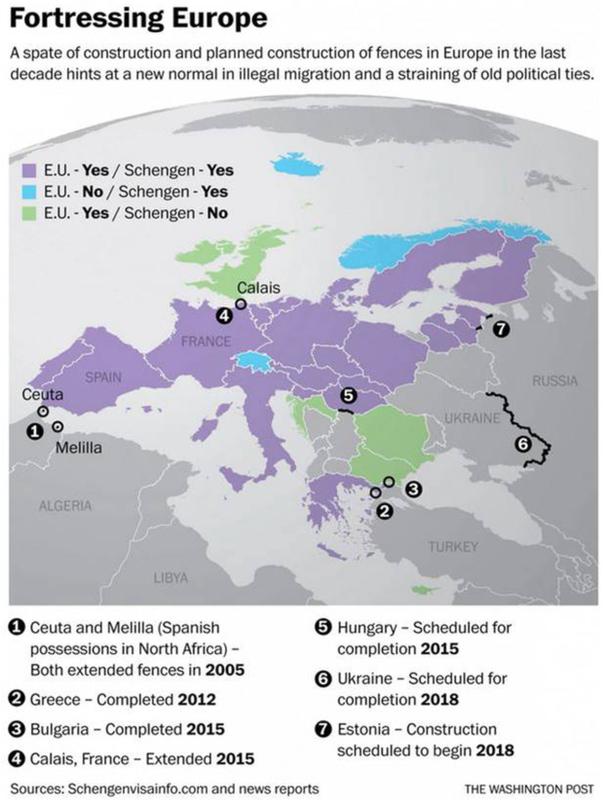 The erection of such border fences on Europe’s edges echo a concept of state sovereignty that seems outdated at a time when the national protection of governments in Syria, Iraq, and elsewhere no longer exists. 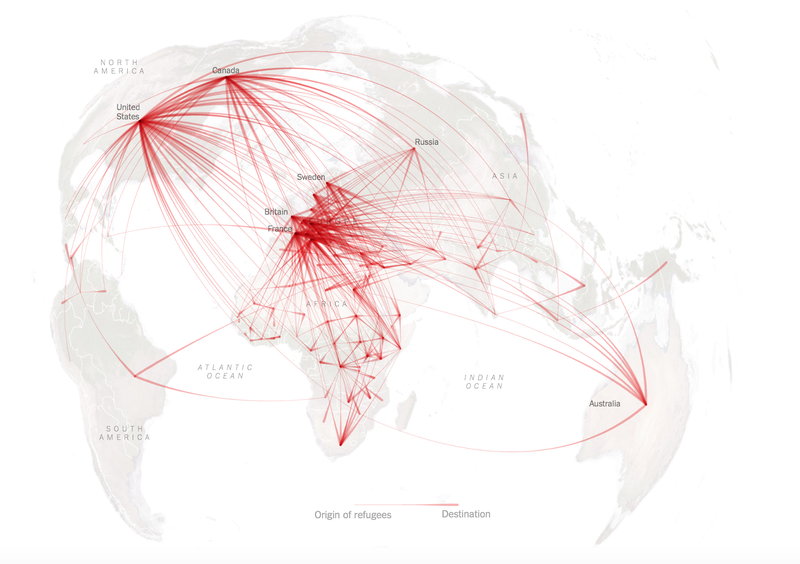 Their creation on a map offer a truly paradoxical means and symbol to cynically assert his own authority, openly rebuking human rights traditions even as he shrouds himself with legitimacy, but has sanctioned the spread of similar frontiers that obstruct the local overland routes on which most refugees have travelled. The long-planned fence championed by the Orbán government as a response to the “mass-migration” of refugees seems to have sanctioned the “return of the long repressed.” For it has given a green light to the proliferation of other border controls that constrain refugees’ movement as they search for safety and homes. The effective obstruction refugees now face has redefined their movement as “illegal”–in ways, that, as Bill Frelick warned, create a categorical confusion that questions the value and rights of humans and transforms their movement across boarders into a punishable event. If this seems to respond to the 85% jump in requests for asylum since 2014, mostly Syrians followed by Afghani, Albanians, and Iraqi, the abdication of actions of processing or accepting individuals in civil society intentionally marginalize refugees. Even if Hungary is only a transit zone for these families of refugees, the construction of a fence responds to their arrival in ways that have only unleashed as a response latent xenophobic tendencies. 4. 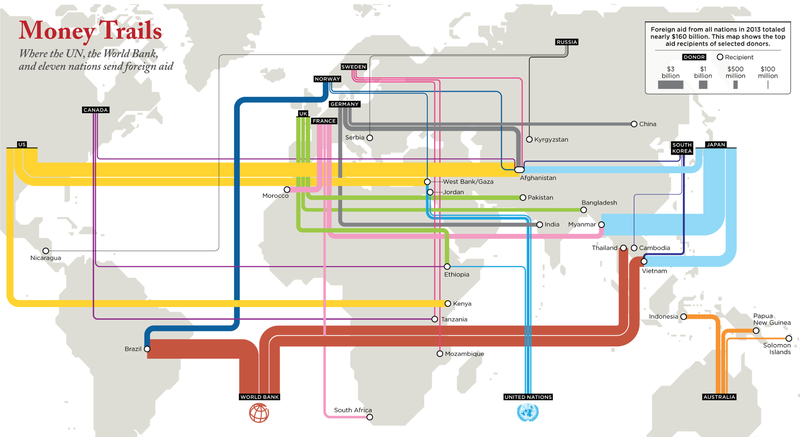 As increasingly desperate and uneasy refugees walk on foot to reach the perpetually receeding illusion of the “rich EU”–many hoping to join their families–by foot, taxis, rented minibuses, trains, or through human traffickers, their searches for asylum are complicated by the relative nature of European prosperity in the poorer countries through which they travel. After refugees and immigrants were granted asylum at rising rates in western Europe since 2010, Hungary has erected a militarized border against those forcibly displaced entering central Europe as if to distance the plight of those crossing the Balkans through Turkey and Greece from the mental space of Hungarians and portray their entrance into the country as a national danger–inordinately magnifying the role of Hungarian law on the already unduly onerous lives of refugees beyond what they ever expected. The difficulty in mapping the numbers of those seeking asylum, and the difficulty of determining where increasingly desperate refugees might settle, complicate the inhuman exaggeration and magnification of the difficulties they pose to governments who may grant them asylum, as do the multiplication of dehumanizing metaphors of swarms of insects, tidal waves, a tsunami, herds of animals, or indeed as an army convert the almost two million who have fled from Syria and live in refugee camps in Turkey. Such metaphors certainly seem to sit well with the Hungarian government, who demolished neighborhoods where Roma live only to pay the cost of their reconstruction; other party members call for a ““final solution” for Roma in Hungary–even as the EU has both funneled money to Hungary to aid Roma and prioritized their integration in Hungarian society. Are our very maps complicit in concretizing and perpetuating such dishonest and profoundly unuseful metaphors as they show the routes refugees take across the Balkans, and the exclusion from countries they confront? Since the now rightly notorious wall was completed on September 15, the Orbán government announced that any attempted crossing the border barrier by families and children will be punished by Hungarian law. The continued “mass-migration” has led the Orbán government to declare a state of crisis in which it needs to defend its borders in ways that trump international law–and the rights of persecuted refugees arriving from Syria, Afghanistan, Iraq and Pakistan, detaining them in “transit zones” controlled by military police. 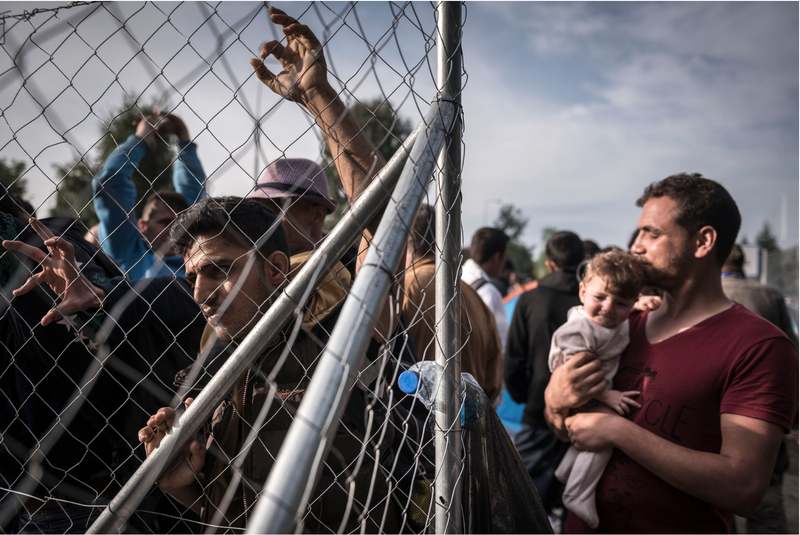 If the fence responds to a crisis in governmentally–alleging that the river of refugees who have crossed the Balkans from Afghanistan, Syria, and Iraq were not displaced–the newly militarized borders of nations facing arriving refugees have cast themselves as victims of “mass-migration” by desperate people fleeing on foot; hastily erected fences are monitored by officers in riot gear, bearing ammunition, and water-guns, installing security cameras at a barrier they are investing a paranoid tenor with quite terrifying concreteness. The chain-link fence topped by barbed wire and security cameras suggests a knee-jerk response to mass-migration with eery echoes of the past. Hungary’s government has only proposed its rights to build analogous fences on the country’s borders with Croatia and Romania–even as UN officials and the UNHCR voiced dismay at the militarization of its southern borderline. For while those seeking asylum view Hungary as a site of transit to Europe, and to a new home, this affirmation of local boundaries and exercise in territoriality places those following the hundreds of thousands who have already fled civil wars in countries like Syria, Afghanistan, and Iraq, in a sort of legal limbo of displacement unforeseen by countries who became members in the Schengen Agreement promising unity to asylum requests. Rather than grant asylum, the labelling of refugees as terrorists, criminals or violent, collectively not deserving entry, rehabilitated flimsy conceit of the border as impassible barrier. Such widespread projects of constructing militarized border fences mark unprecedented local distortion of the thirty-first article of the Geneva Conventions. The consensus of preventing punishment for refugees illegally entering any territory of a contracting State responded to an era of violence Europe sought to banish. But the barrier distorts Hungary’s place in the world, by treating those who seek passage through Hungarian lands as criminals who are to be kept at a gate. 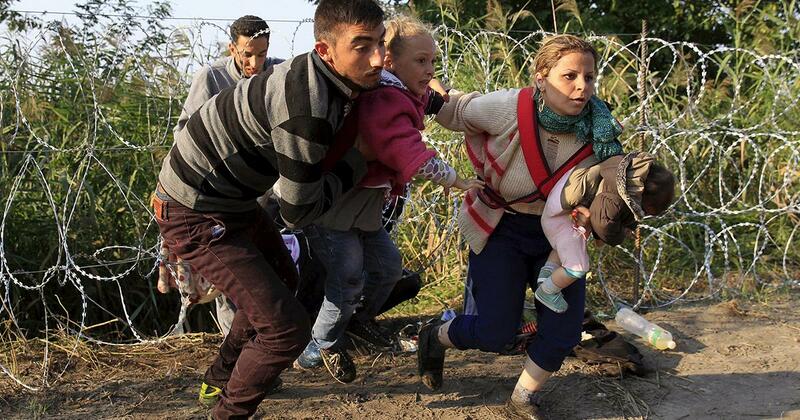 While the Geneva Conventions affirmed rights for those with refugee status, without medical care or financial means. the criminalization of border-crossing lies not within any nation’s right to police its boundaries, as has many sustain in the United States, is an affront against humanity and international law. 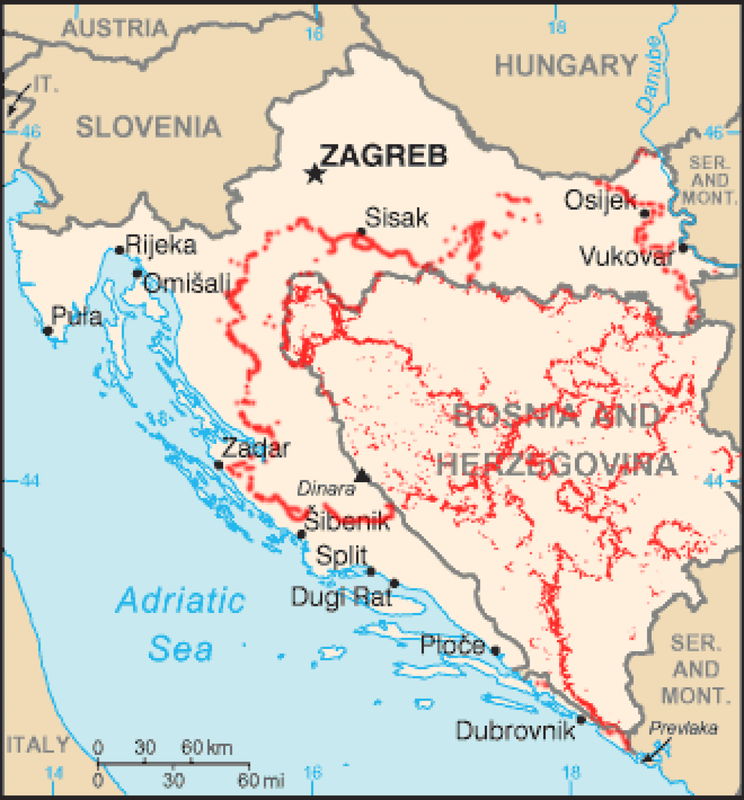 The desire to shunt refugees through Croatia, rather than Hungarian lands, conceals the ugliest of inheritances in the Balkans–and its distinctive topography of active land mines blocking most paths and roads to Austria or to Zagreb. 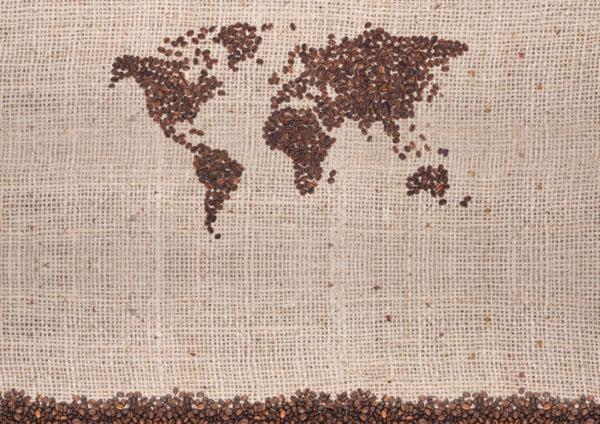 The obstruction of the progress of landless refugees lacks any sense of the global dilemma we increasingly face. For the notorious fence strikingly reveals how this oldest of designators of territoriality has been rehabilitated and so openly championed when the pathways of refugees across borders is both common and challenging to visualize–and distorts their plight as if it were a purely local affair of following procedures, but whose Kafkaesque character conceals a hatred fueled by xenophobia. Such authoritarian boundary-building is all too easily justified by ignorant questions of who deserves refugee status or which government is rightly tasked with processing petitions of asylum–even if Schengen accords clearly place that responsibility in the country of entrance, the massive movement of nationals across the Balkans was never imagined. Rather than appreciate human displacement, the Hungarian decrees unilaterally police entrance into a region of passport-free travel by local law; those seeking asylum are “othered” as illegal, and deserving punishment, without recognition of their dire trajectories or desperate search for new homes: labelled “migrants,” rather than refugees, those fleeing civil wars and destroyed states are portrayed as opportunistically seeking benefits and jobs–rather than the economic air political security that is their legal right. As much as the arrival of refugees challenges a notion of governmentality, refugees are unfairly recast as offenders decorum who stand in violation of legal codes. 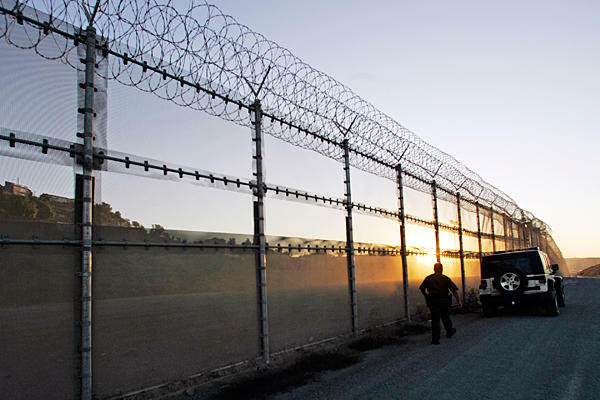 The argument for building boundaries on our borders to prevent human border-crossing is not without other precedents, as Americans well know–and are knee jerk responses to questions of governmentally, as much as they offer responses to human needs. Is it a coincidence that the assertion of this imaginary borderline by an actual wall–similar to the fortified border barrier between the US and Mexico, lambasted by Vincente Fox as “disgraceful and shameful”? President George W. Bush had prioritized the fence to prevent “illegal entrance” and immigration in 2001. It has not prevented migrants from crossing–and, as Michael Dear noted, whatever deterrence of migration is created by the barrier, it can hardly justify the “enormous expense of maintaining the fortifications — estimated to be $6.5 billion over the next 20 years.” But the game was always primarily political, and when it was resurrected in the first platform paper Donald Trump released for his presidential run, he cast the plan to expand the border barrier in particularly xenophobic terms–and may have led the hapless Scott Walker to continue the folly of drawing borders by casting wall-building on the US-Canada boundary as a “legitimate issue”. The border barrier Orbán erected along Hungary’s southern frontier echoed that on the US-Mexico border, but averts eyes from the refugee crisis: “Don’t come,” an aid to Orbán quipped, “because this route doesn’t lead where you want to go.” “Don’t come here anymore,” chimed in Serbia’s Interior Minister, pressing his government’s control over passage; “This is not the road to Europe.” Inhumane response almost taunt refugees–as liberal use of pepper spray, water canon and teargas against those who have tried to breach the barrier materialize these only slightly veiled threats. The fence not only keeps out refugees, but imagines their distance from the Hungarian state, and indeed costs Hungary as a frontier of Europe–and a country of Christian Europeans. Much as patrol agents prevent passage at the US-Mexican border, the border barrier distorts questions human rights by way of recasting them in terms of national defense, in ways far less constructive or considered response to human needs or occasion needing international cooperation. 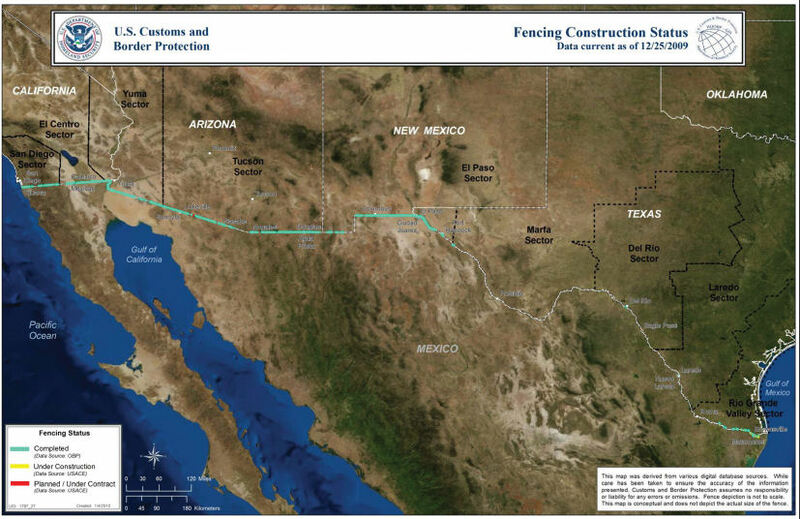 The fence that several presidential candidates propose to further expand the fence that runs along a third of the boundary ignores that the fence’s ineffective role in stopping migrants than has the US Border Patrol–the border barrier has been ineffective in discouraging migration, although it has actually prevented migrants from returning to Mexico–expanding 83 miles of fenced border to militarized expanse of 700 miles at a cost of $2 billion. The embrace in Hungary of fortifications that recalls the triple curling of concertina wire atop the US-Mexico fence at Tijuana “to make the border safe and secure” claimed to have reduced illegal border-crossings by 50% in 2008, forgoing the “aesthetically pleasing” federal design standards used in other regions of the US-Mexico fence, the fence is a similarly foreboding remapping of the boundary line for visual effect in a new rallying cry. Donald Trump’s logic that “A nation without borders is not a nation” seems adopted by the Orbán government’s actual plan. The improvised barricade constructed iduring the summer of 2015 runs along Hungaryy’s southern border with Serbia seeks to create the absolute division one might read in a regional map. But protection of the actual border may have somewhat less relevance to FIDESZ Prime Minister Orbán than the desire to appear strong in the face of the anti-migrant and anti-gypsy rhetoric he has profited from and continues to incite. 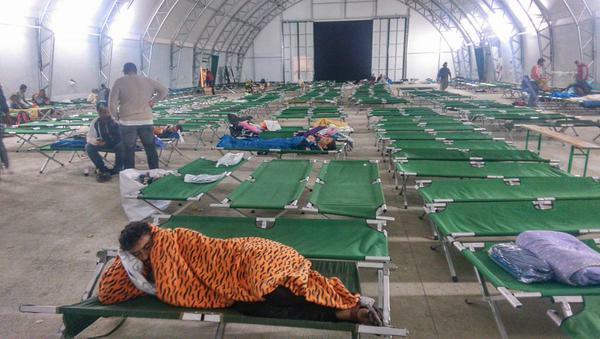 Orbán declared with mock magnanimity that “the tolerance period is over” for granting refugees asylum as it was erected, intentionally creating, seeking to “stir up popular sentiment against immigrants and refugees” by any means possible, observed Marta Pardavi. Despite being a signatory to the Geneva Convention that makes it incumbent to accept refugees from war-torn lands, even to a country which sees itself as poor, the wall prevents recognition of refugees–each of whom the far-right-wing Jobbik party, which has portrayed the arrival of refugees as a failure in local governance, argues will cost Hungarians 4300 HUF daily, in a country where daily unemployment benefits for its citizens come to 2362 HUF. In this politicized context, the plans for enforcing the construction of the fence along Serbia’s border primarily constituted a strong public statement. The enforcement of the boundary barrier illustrates Orbán’s commitment to a distorted image of the Hungarian nation’s integrity, and suggesting his willingness to defend Europe from refugees who most saw as fleeing from their lands, but he portrayed as alien migrants. After protesting delays in its construction, the deployment of troops to this newly militarized zone to stop those seeking transit to Europe creates fixed portals for processing people without according them human dignity, for the rationale that “They don’t look like people who could become useful members [of society].” There is all too clear a danger that the refusal of Hungary’s Prime Minister and government to process refugees who seek asylum and have traveled across the Balkans on foot from Syria, Afghanistan, and also Iraq is an attempt to pander to the right-wing Jobbik party, who have consistently claimed and asserted that the current government will not be able to solve the refugee crisis as it has staged public anti-refugee rallies in Budapest that distort the dangers that the “migrant crisis” will cause the nation–and that Hungary’s current government fails to fully address. The imagined dangers posed by such refugees, wrongly cast as opportunistic threats, or immigrants in search of work, uses the border from a map as a way to disengage from refugees’ actual plights. (Indeed the unstinting support Hungary’s Foreign Minister voiced for Germany’s decision to start border controls on rail travel from Austria seems a poorly disguised attempt to unite Europe against the arrival of refugees.) 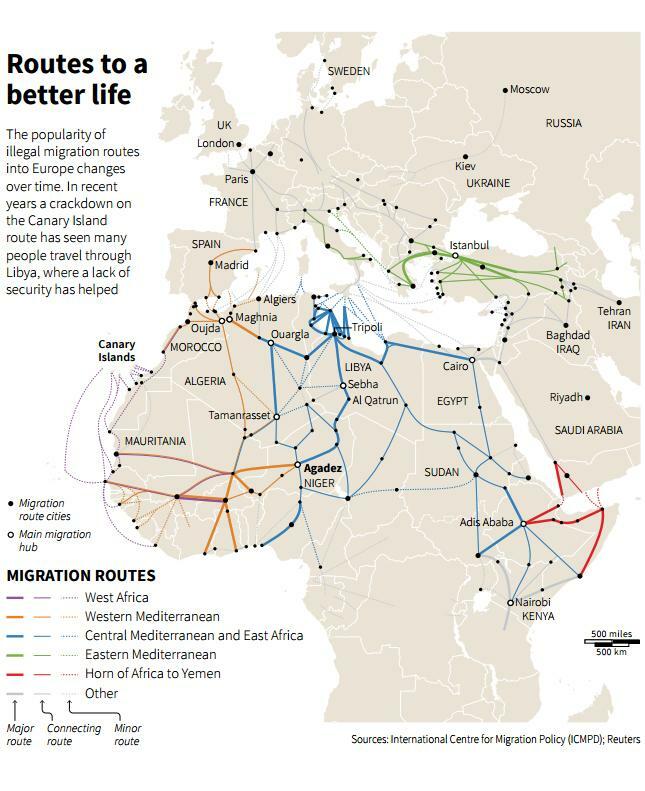 Meanwhile, alternative routes refugees might take to have been proliferating on social media. Will the creation of such controls, now enacted by both the Netherlands and Slovakia and apparently being considered in Denmark, impel more human smuggling of refugees who are often both educated and able-bodied and even with cash reserves, and expand the humanitarian crisis of refugees? 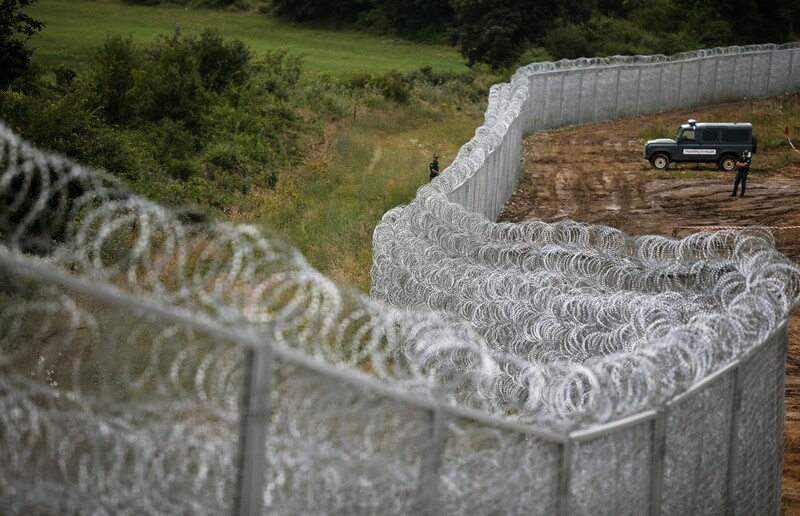 Has the Hungarian government’s sanctioning of the building of this fence from June 2015 given rise to a knee-jerk defense of territoriality? Or has the fence also inspired a return of memories of strongmen from Hungary’s past? The completed border fence on Hungary’s border with Serbia is more suitable for animal chattel to halt the progress men, families and children, and constitutes a new low point in local respect for human rights–oddly resonating with how members of Orbán’s party liken Roma people in Hungary to “animals” who are “not fit to live among people.” As much as it reveals a panicked response to the global rise in refugees, the chain fence reveals the reluctance of Hungary’s government to confront the problem of refugees, and refuse, ostrich-like, to believe that problems might enter their own national space–a space from which Orbán’s circles have already expelled Roma. The rhetoric of the wall closely mirrors the project of wall-building US Presidential candidate Donald Trump openly xenophobic proposal to extend a fence across the US-Mexican border to ward off the arrival of “criminal” Mexicans, as much as migrants in search of work who the wall originally targeted. Indeed, the Orbán government’s “defense” of the boundaries to Schengen countries of the European Union both recalls the creation of an impermeable US-Mexican wall, 700 miles of which already exist–and uses the outdated nature of the national border despite the limited value of border patrols beyond public political posturing. Is it only a coincidence that the strengthening of such walls parallel the vanishing of the frontiers and borders that once defined the imaginary integrity of the nation-state? 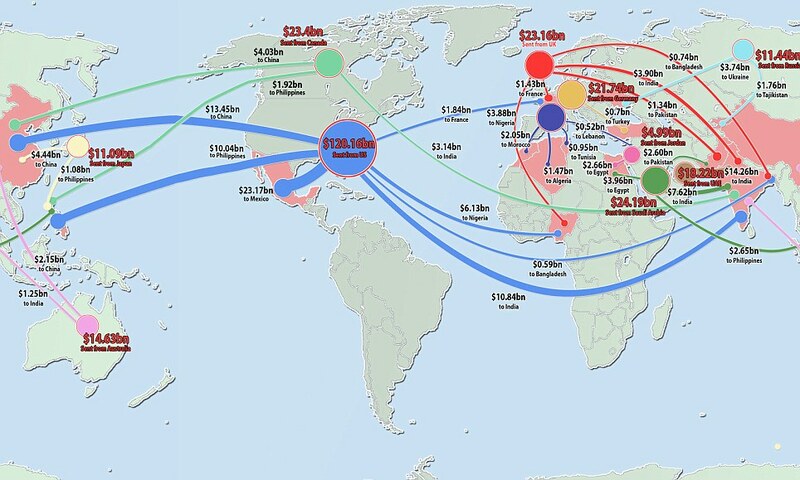 Both “walls” ignore the growing irrelevance of the borders in a global situation. Both take refuge behind the most antiquated of artifacts: indeed, the construction of such barriers only affirms the declining significance of the border as an actual divide, in the face of anxiety about the diminished meaning of national borderlines, and offers opportunities for photo-shots to affirm a national imaginary. 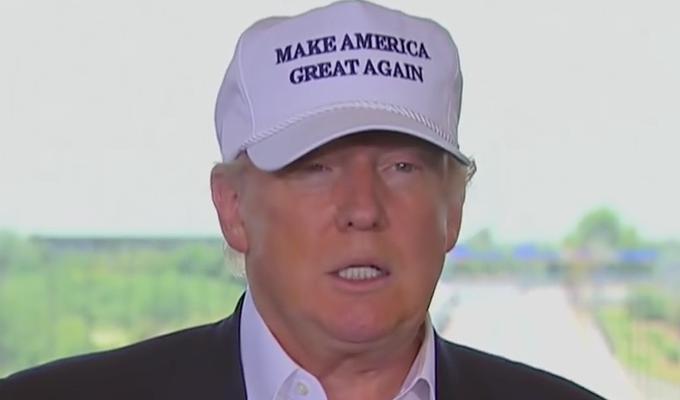 Is it only a coincidence that Trump trumpeted an expanded border barrier against the “extreme danger” of Mexican arrivals at the campaign stop he made at the border city of Loredo, TX, for the first time sporting a now-famous trucker hat bearing his campaign promise to restore America’s national greatness? When the unlikely presidential candidate looked at the camera declaring that the future of the United States rested in extending border barriers along the entire US-Mexico boundary against “illegal” migrants, Trump unwittingly offered a defense that has been adopted by countries who take it upon themselves to militarize and police Europe’s borders. As Trump espoused the expansion of border barriers that illustrate national sovereignty in an age that demands increasing international cooperation, the devotion of attention to the policing of boundaries comes at huge cost for addressing refugees’ actual needs. 5. 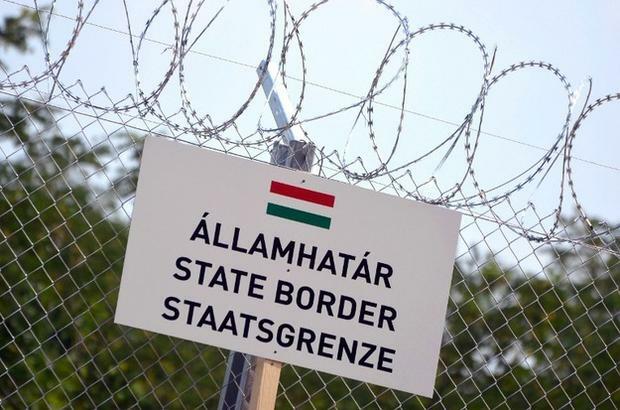 The Hungarian government has similarly linked the militarized border-zone built along its southern border to the preservation of its national identity. The fence intentionally creates a no-man’s land and quasi-police state suspending human rights, filled with refugee camps which fail to help prioritize or meet individual needs, and dehumanize refugees, in the ugliest of illustrations of inhumane treatment at “migrant centers.” For the razor-wire fence that traces Hungary’s southern border with Serbia seems both to be an abdication of legal responsibility and ethical obligation to those seeking asylum from war-torn nations–and a misguided local response to a global problem whose actual proportions it sadly seems to seek only to obscure. As much as the wall on Hungary’s border has complicated questions of European unity and identity, it puts into crisis a coordinated response to the global problem of refugees. As Hungarians seem to refuse to grant asylum as the first country in the Schengen area, where passport-free travel is allowed, it has offered a case where the global crisis of refugees in need of protection have been met by a hostility that treats their movement from shattered pasts as a threat to the civil society–and intentionally obscures the role of Hungary as a transit country. How did this come to be? 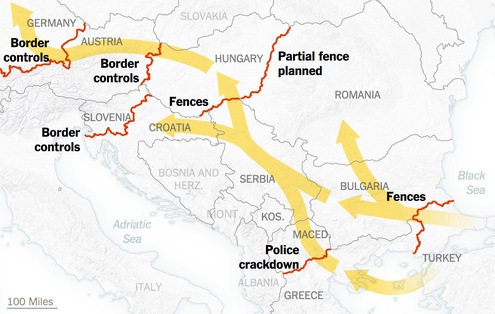 The border-fence built by Hungarian soldiers seems created to prevent any passage of refugees seeking asylum, but suggests a cynical exploitation of a global crisis. Building an improvised wall of some one hundred and eight miles, complete with a public announcement that any damage to the temporary fence along Hungary’s Serbian border will be punished by imprisonment, is a theatrical attempt to refuse housing or accommodating the refugees who have travelled across the border since the Spring by foot. For the highly staged building of a such a highly symbolically charged, breachable, and deeply inhumane metal-link fence–whose breaching will be punished, according to the books, by three years imprisonment. 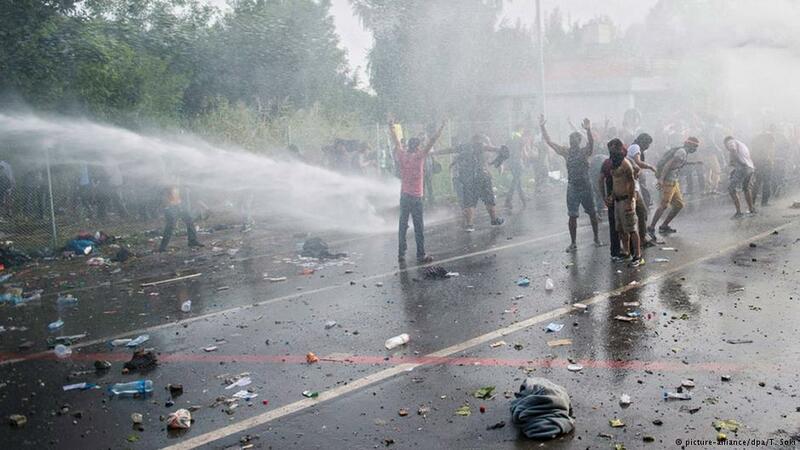 For those seeking refuge from persecution are indeed regularly beaten by police as if they were criminals and left “in legal limbo” in Serbia and Macedonia, wbhie seeking asylum as they try to enter the European Union. Refugees have been forced to face increasing barriers created to their entrance to Europe even as they are subject to routinized bad treatment and forced to negotiate police brutality on Europe’s borderlands. “We are human too,” plead refugees, fearing state police. Orbán’s fear that Hungary may receive some 800,000 asylum requests, and by “next year we will be talking about millions and this has no end,” has fomented xenophobia against refugees at significant human cost, and perversely magnified the problem of those seeking refugee status as a purely national problem at significant cost. 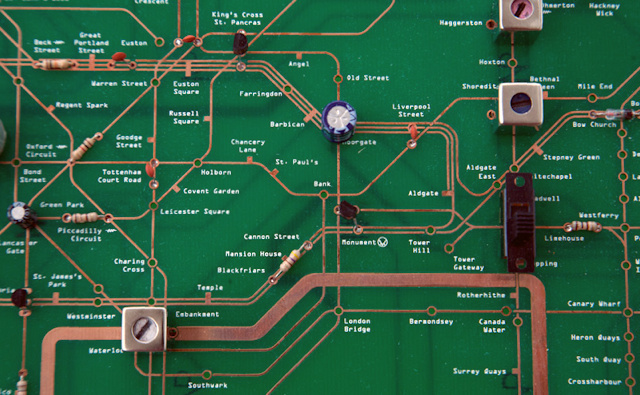 But the true disgrace, as the invocation of a line on a map–the line of the European Union–but is the last in a series of protective insular walls of small-minded construction. 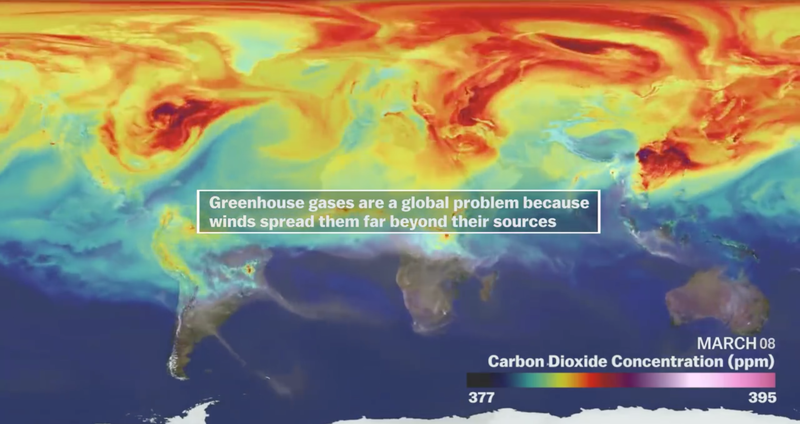 It symbolizes a quite desperate and panicked attempt to keep reality at bay, in the perversely misguided belief that a truly global disaster could be either held at bay or flat-out locally denied. 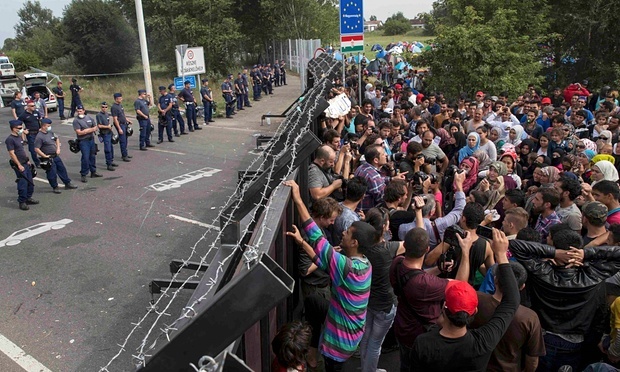 But the arrogant assertion of the fence is far more emblematic of the hysteria that the Hungarian government seeks to stoke rather than it contains any legal justification. At the same time as refugees seeking asylum have abandoned perilous transit across the Mediterranean, and were rebuffed by Iran, Hungary has become a default to enter the EU and area Schengen accords that permit travel without a passport. 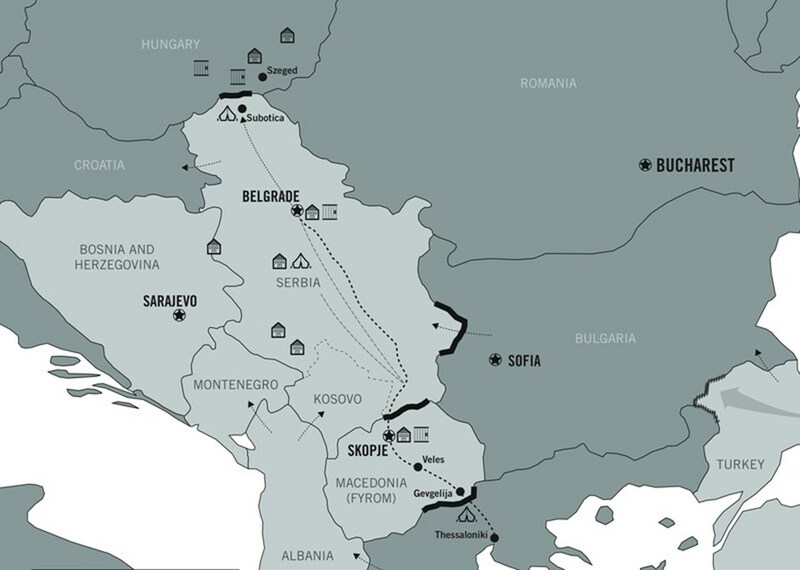 Passage by the Balkans is now the recommended by smugglers as a route of transit–such smugglers seem to have a more clear map of the geography of displacement and challenges of asylum than even the UNHCR. Although Hungary has received a significantly larger number of applications for asylum for refugee status by June, 2015, when Orbán announced the wall’s construction, the requests are merely a way to enter a new life in Europe–as all refugees are obligated to declare their status at a point of entry. Rather than process those seeking asylum, the wire fence barrier is both a blatant and a cynical rebuff to human rights and legal rights, and an exercise of turning the other shoulder to those attempting passage. The dedication of public funds to such a barrier seems a further violation of refugees’ legal rights, and constitutes a glaring slight to if not an actual crisis of international law. The position adopted by Hungary’s FIDESZ government deeply distorts its position in relation to Europe and the world by casting the “crisis” in purely local terms–far beyond the practical difficulties of processing and registering refugees who cross its southern border with Serbia. The distortion of a ‘local’ crisis created by “migrants” has led the government to use state radio and immigration police to use the border barrier to remove desperate global refugees from their own mental space. The dangers distort precedents of anti-semitism and xenophobia that the government has long pandered: indeed, the strongly anti-gypsy rhetoric Orbán’s party has recently exploited and normalized has been rapidly refashioned as Islamophobia, in ways that echoes the antisemitic rhetoric of one of Hungary’s pasts. As much as the fence reflects an actual rise of immigrants with Hungary as their destination, the figures of those seeing asylum in Hungary the wall is part of a highly choreographed if misguided moment to rebuff refugees that will allow his xenophobic FIDESZ government to prevent refugees from entering the attention of the government–and claim to represent not only the Hungarian people, but by arrogant and increasingly evidently self-important assumption, all Europe. 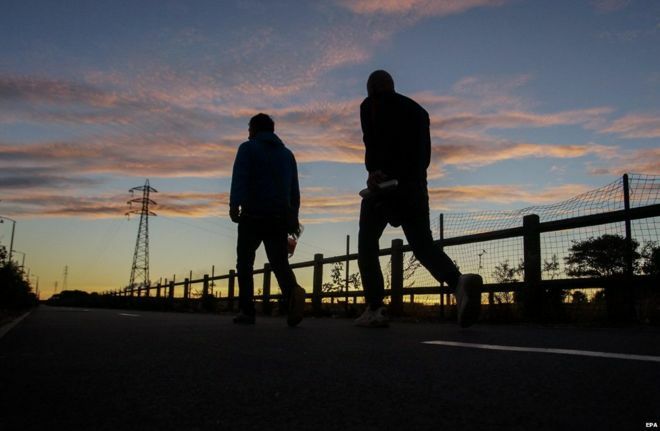 As the Balkan route of refugees grows, even as the rights of refugees fail to be adequately defended, a renewed on-foot march of refugees to Austria and beyond has resumed. Even as a refugee policy is not clearly in place. Illustrating belonging and its boundaries is what the Hungarian government’s spectacle seems chiefly to address and to do in particularly terrifying terms. The severely imposing barricade (or fence) constructed from June is the latest attempt to prevent refugees who have travelled from Syria and elsewhere from crossing the frontier–although their suggestion of a fence more worthy of animal pens than humans reveals the disdain and hatred that the Orbán government has concertedly sought to direct to the refugees, to obscure their own dire situation, as much as the threat that they purportedly pose to Hungarian social services–and to treat refugees as human chattel that Roma people have been so regularly cast. There a sense that the current and ongoing crisis of processing refugees creates a conceptual crisis in the nation-state, but the reaction to an influx of refugees from Syria, Afghanistan, or Iraq. But it has been highly staged as a way to deny the humanity of those fleeing, rather than to need to address their misfortunes, and the response of other countries, as Austria, reveals a clear possibility of a different reception for refugees in Europe, less dictated by fear. 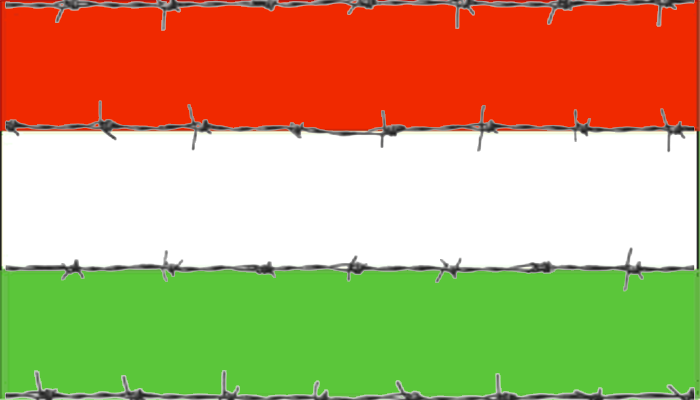 The cyclone chain link fence that along ten miles in length was planned on a political map, in hopes to prevent a global disaster from entering the mental space of the Prime Minister and of sustainers of the right-wing FIDESZ party, as well as Hungarian territory–it stands for a reactionary impulse to affirm the impermeability of the country’s national frontier is an unacceptable reaction to the arrival of refugees in increasing numbers and with increasing desperation. By exploiting the status of Hungary as the first Schengen nation able to grant asylum, tasked with the job of fingerprinting and processing refugees, the Hungarian government has opportunistically and inhumanely decided to exploit its situation to prevent those seeking asylum from entering the European Union, in ways that have tended to elevate its status as a frontier for its own ends. 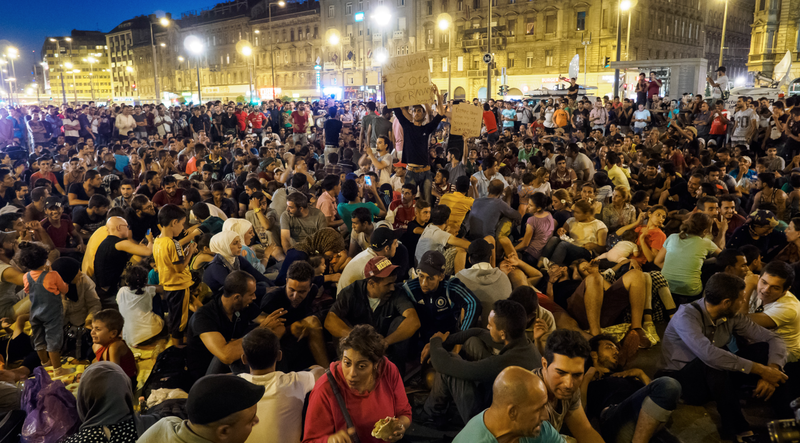 While the problem of processing refugees is surely not only a European one, the position that the Hungarian government has taken is more than opportunistic. The overtly protectionist barricade is an attempt to force those desperately seeking asylum, and may also encourage them to search for other, riskier, overseas routes. It seems, moreover, inseparable from terrifying images of the mute rebuff met by the anguished face of terrified refugees. But it is also a deadly political game. Prime Minister Orbán’s Foreign Minister, Peter Szijjarto, stoically vowed in mid-June of 2015, unilaterally and with the apparent intent of stoking alarmism, that his country “cannot afford to wait any longer” having processed 54,000 immigrants and with the count of refugees poised to rise 120,000 by the year’s end–even though Hungary was actually way-station to asylum elsewhere, rather than a final destination, for most, and was obligated as the first nation in the Schengen area to grant asylum to refugees who had crossed the Balkans. But the sense of desperation that he voiced reflected a deep confusion about the place that Hungary seemed to have inherited on the border of Europe. The fence slated for completion in August, 2015 was not alone; it was only one in a series of fences that Europeans are engaged in building as they wrestle with new global patterns of refugee traffic in Calais, Greece, Bulgaria, Estonia, and the Ukraine, misguidedly construe local perceptions of a truly global crisis–much as Orbán has recast the plight of refugees as a conflict between opposed faiths. The reaction to refugees has been particularly poignant in Hungary, and has prompted news maps to characterize the dreams of the ruling party to create a gate to Europe, as much as provide a possible response to hopes many refugees will continue to nurture. Sealing the border with a militarized chain-link barricade provides a particularly stony rebuff, truly terrifying, evident in images of recent encounters with the anguished faces of desperate and panicked refugees who sought asylum. For the attempt to block the flow of refugees what one seems to erecting is not only an inhumane gesture, but a desperately local distortion of a global problem. The fence has recently impelled French Foreign Minister Laurent Fabius to express credulous wonder at the scandal that this act disrespects European respect for human rights–as United Nations refugee agencies stepped just short of condemning the construction of a fence as a fit response to those searching for safety and protection–and asylum; the Swiss would ban Orbán’s travel to their country, and freeze Hungarian assets in response to indignation at the “human rights situation and the refugee scandal” in the country.” The fence may well encourage those fleeing their own perilous conditions from adopting still more dangerous itineraries and routes of illegal migration. “This wall–we will not accept it,” Syrian refugee Mohamed Hussein bitterly observed, pausing on travels through Turkey and Serbia, as he attempted to walk from Iran to Turkey. How can one, however, insist on responding locally to a truly global dilemma of desperate flight? 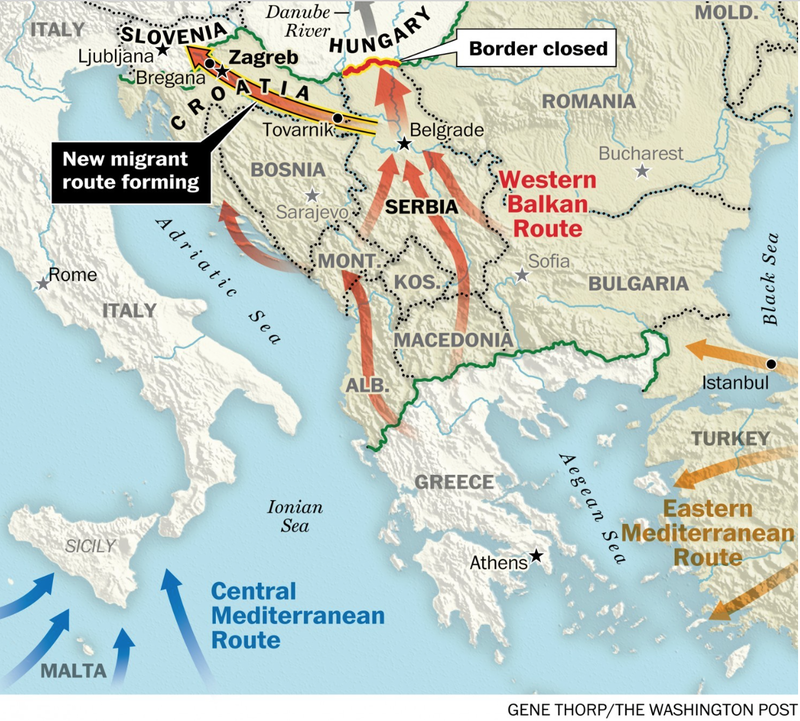 Even though the actual routes of illegal immigration of refugees are so complexly negotiated and improvised to defy a clean cartographical synthesis, the actual routes of refugees were rarely imaged as running through Hungary on earlier news maps. 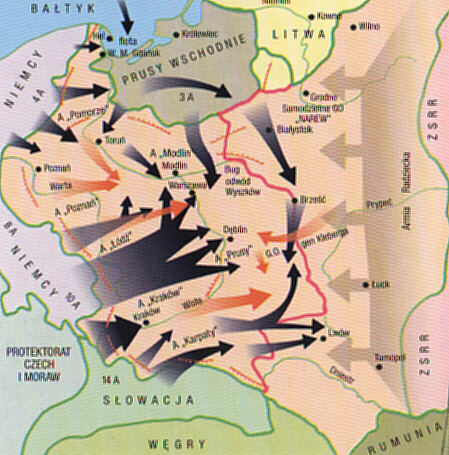 The bold and forceful red arrows that lead directly through Hungary conjure the flows that the proposed barricade proposed to stop or “staunch” along the boundary lines between Hungary and Serbia. 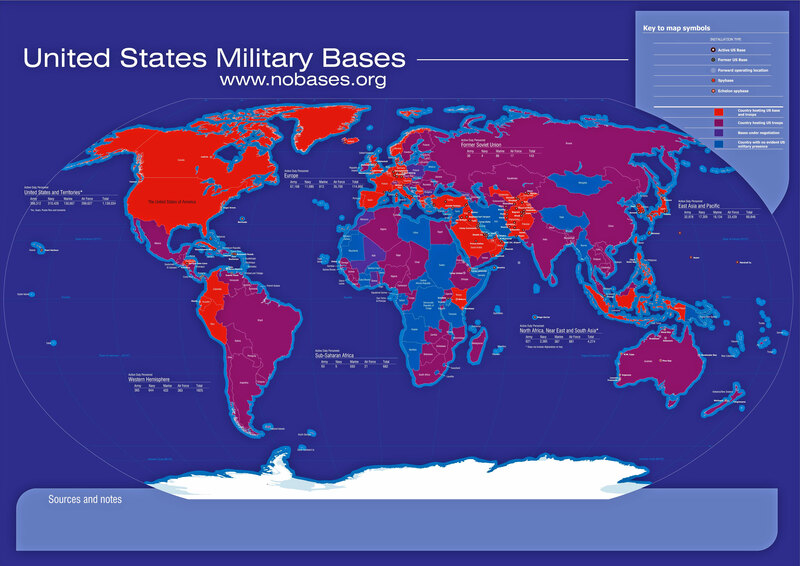 The propaganda map issued by the Office of Immigration and Citizenship seems designed to intentionally stoke xenophobic fears, emphasizing the nation as a unit of continued meaning in an emergency of truly global proportions, as well as to magnify the role that such a fence on Hungary’s border would have. 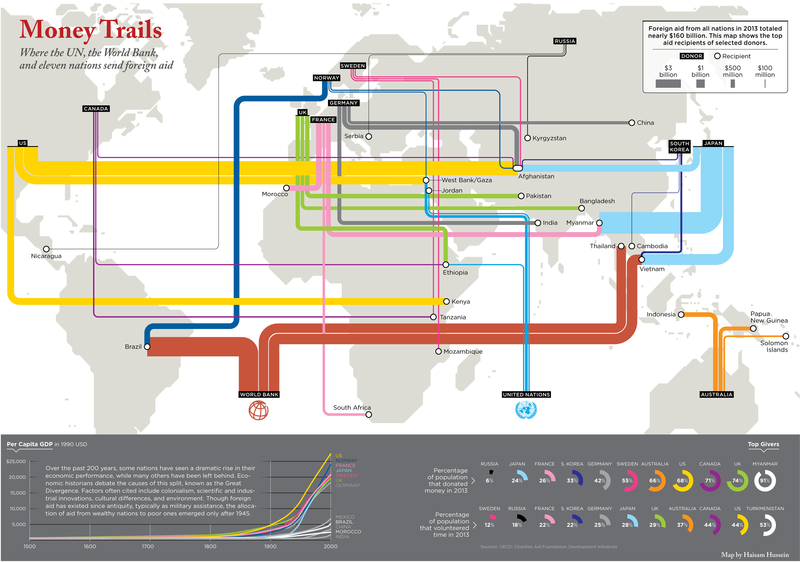 There is something grotesquely inhumane to chart the itineraries of refugees who have travelled on foot from Iraq, Afghanistan, or Syria as if they were a phalanx of approaching Panzers, adopting the rhetoric of a map of military advances–although the refugees who often took these paths often travelled not only without arms, but barefoot. 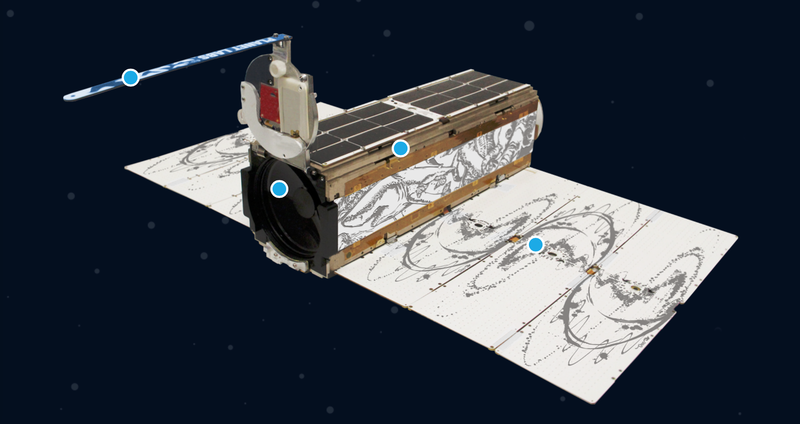 But the map conjures a threat as if it were in danger of being immediately posed to the national frontiers. The actual routes of refugees take are considerably more complicated and improvised, of course, but when schematically mapped reveal routes less exclusively focussed on a Balkan itinerary–although this is one of the sites of greatest police push-back according to Amnesty International–until they find detention centers to welcome them across the Sebian border. Yet the image echoes the deeply xenophobic fears that the Orbán government has intentionally sought to stoke. 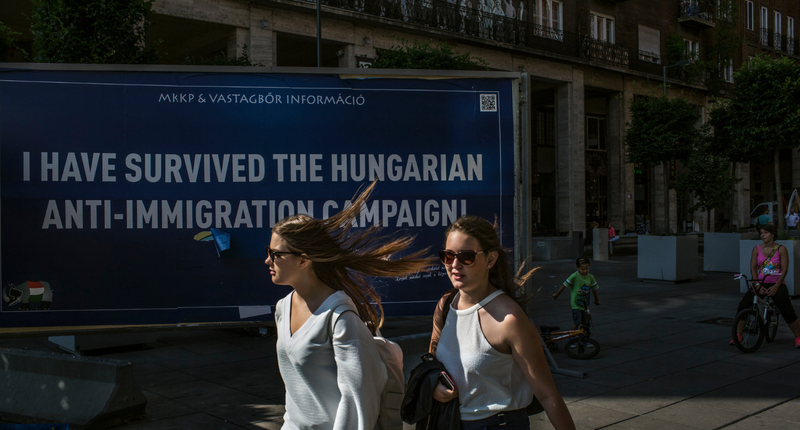 Faced with growing unemployment rates and nourished by openly racist xenophobia, the 23,000 people who applied in the past year for asylum in Hungary alone from Syria, Afghanistan and Iraq no doubt created a basis for panic in the Orbán government and ruling Fidesz party, whose prominent display of public billboards cautioning asylum-seekers “IF YOU COME TO HUNGARY, YOU CANNOT TAKE HUNGARIANS’ JOBS” in Hungarian were not only the revers of a red carpet, but widely cast their xenophobic rhetoric–long adopted by Orbán’s FIDESZ ruling party–in the disquieting garb of national protectionism. Despite the posters, however, Oban has continued to state that the arrival of Muslim immigrants poses not only a challenge to jobs, however, but a challenge to Europe’s faith in particularly incendiary rhetoric, describing the “madness” of the current EU immigration policy as a departure from common sense. –providing images of integration of immigrants that the FIDESZ seeks to banish from Hungarians’ minds. The rhetoric of preventing the arrival in European territories of refugees who have travelled through the Balkans appeals to the nationalist imagination of some Hungarians. The fence was build, allegedly, in a move of protectionism of European identity, “to stop the flood,” as Zoltán Kovács, government spokesperson, coldly put it, indulging a particularly dehumanizing rhetoric that has led not only to the construction of the fence. In going so far as to claim that Hungary is “the most affected EU country in absolute terms,” the government has perversely distorted a crisis of painfully global proportions by representing it in local terms. 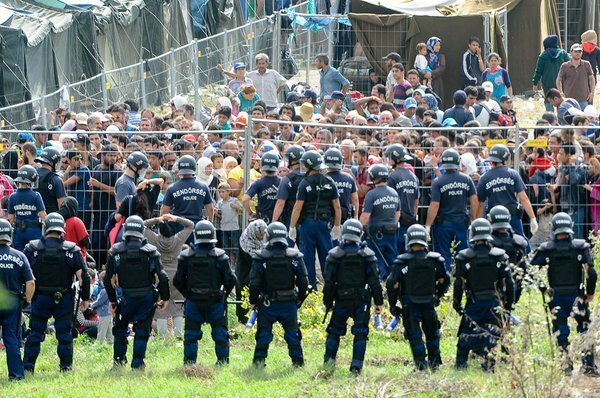 The defense Prime Minister Orbán openly made advocating the use of internment camps as suitable responses to immigrants reflect this perception that Hungary lies the “forefront” of the immigration crisis–although this crisis is clearly global–in order to justify the building of a fence along the Hungarian-Serbian border of over 100 miles in length. Overrun, we might well ask, with whom, or with what? It is true, the strident rhetoric of Orbán’s government may build on a series of similarly xenophobic precedents by which flustered bureaucrats have, maybe imitating the United States, built walls–perhaps more for their own populations than as actual preventive measures. In seeking to terrify immigrants and refugees, Orbán has all too openly conflated the dangerous criminal and the immigrant with particular zest. For the image of a fortressed Europe is a scarily common reaction to fears of immigration that many Europeans can barely suppress, and may press unique pressures on the European Union. –no doubt in part due to the proximity of London to the 3,000 refugees crowded into substandard camps in Calais, where refugees are waiting to cross the channel, even as British PM David Cameron has publicly ruled out the granting of safe havens, as Englishmen have volunteered to provide them with some relief in migrant camps, and hundreds from Ethiopia, Sudan and Somalia daily risk travel to England by train and ferries. 6. The demands to contain the global flow of refugees has often been perceived in a very distorting local optic that seem less interested in care–or of conceptualizing care–than of creating clearer boundaries than refugees might perceive. Such public works projects suggests unique pains of the human rights crisis of refugees seeking asylum, albeit that these attempts have so far been largely located on the margins of the EU (Bulgaria; Greece; Estonia; and Ukraine)–and uncomfortably imitate the same sort of strong-man statist rhetoric with which Orbán confronted his own government’s crisis. But the truly terrifying materialization of the border line with razor wire in the lengthy fence along Hungary’s border with Serbia conjures a distinct flavor of xenophobia, no doubt, of dubious legality, oddly analogous to the Catch-22 type of situation at Budapest’s Keleti station, where refugees are clustered, confined by guards, in ways that have increasingly come to reflect the markedly increased brutality that the creation of fences so often inspires among border guards and police officers. Did the existance of the fence not increase the markedly inhumane violence of border guards and police at Keleti station? 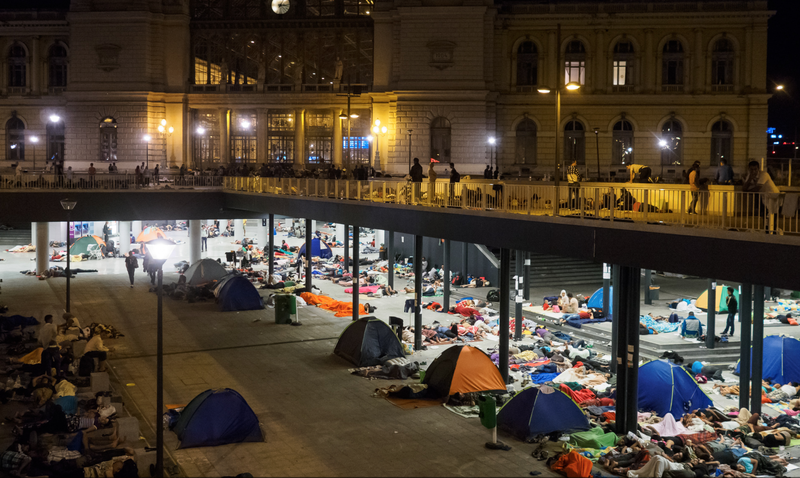 Such rhetoric is tied to the improvised creation of a counter-city that has emerged at Budapest’s Keleti railway station, as migrants are denied transit on trains that would provide passage to other EU countries where they would more readily be granted asylum. 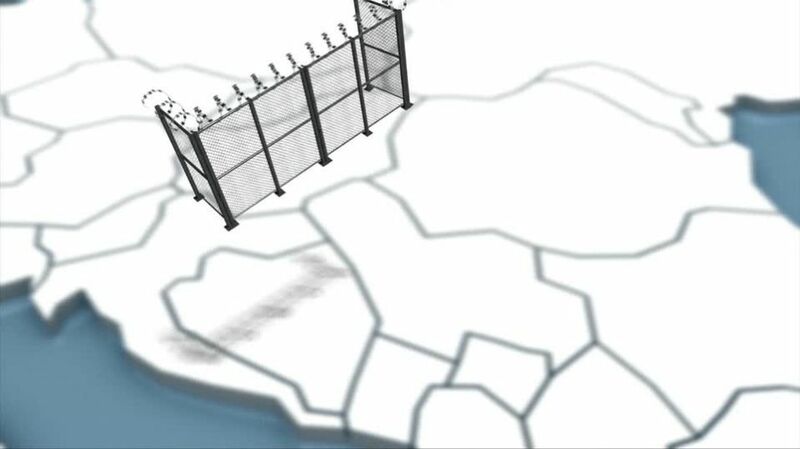 Is detention, and the prospect of the completion of the iron fence–so analogous to the fences that Donald Trump has promised to build along the United States’ border with Mexico, and based on the distorted logic of viewing non-nationals as akin to terrorists that has been diffused by the US Office of Homeland Security–either an adequate or humane response? Fears of the brutality of guards brought into face-to-face confrontation with immigrants who border guards feel are both illegal and guilty of having entered across a state-built barrier seem more likely to occur. 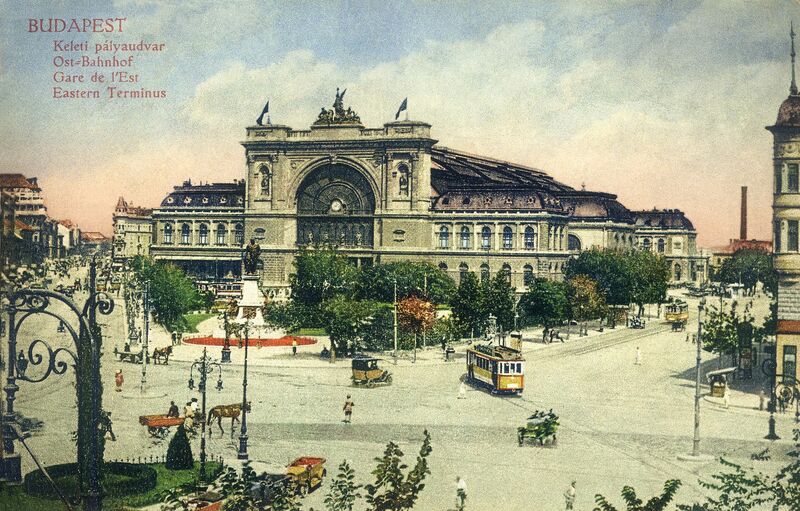 There is something deeply troubling–and deeply pathetic–that the Eastern Railway station of the capital, a triumphalist beaux arts symbol of the Hungarian nation’s new image of industrial progress, has become a site of confinement–and of refusing to asylum or refugee status to those seeking passage to Europe. The marginalization of these refugees to a stateless limbo hopes that their problem will go away, rather than develop a consensus that their fate remains a pressing problem needing collective attention. So much seems a symptom of the priorities that the Orbán government has established, as if to deny any possibility of refugees’ entry and to deny their actual itineraries and travails.